Performing at optimal levels and getting most out of the optical sighting instrument, no matter how difficult the condition, is of utmost importance to a shooter. This is where accessories like rings, bases and mounts come into play. 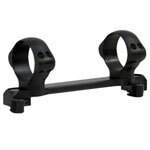 They are indispensable part of mounting your scope on the rifle or gun you are using. Keeping this in mind, Scopelist has brought an interesting lineup of brands, cutting-edge designs and enough variety of riflescope accessories to give you exactly what you’re searching for. In the offing are renowned brands like American Rifle Company, Badger Ordnance, Blaser, Barrett Optics, Nightforce Optics, Seekins Precision, Talley Manufacturing, Carl Zeiss Sports Optics, Trijicon and much more. Just browse through and buy the accessory you are looking for. The collection of accessories including rings, mounts, bases, and others are of highest quality, crafted with super strong materials, and armed with increased levels of adaptability. So problems arising due to incorrectly mounted scopes, improper adjustments, undue stress, and the like, will be passe now. Check them out and buy at affordable prices!